If you’re expecting a gift card from your boss as an end-of-year bonus, enjoy it this year because you probably won’t get one in 2018. The Senate tax bill would ban such rewards. Why? Because Republican lawmakers are determined to prevent ordinary workers from pocketing a $25 or $50 gift card without reporting it as taxable income. Meanwhile, these same politicians are planning to dole out billions of dollars in tax breaks to the very wealthiest Americans. For example, they’re planning to gut or entirely eliminate the estate tax, a curb on extreme wealth concentration that currently applies only to fortunes worth more than $11 million per couple. Republicans are using this prejudice against working people to justify a massive giveaway to wealthy political donors. While giving the rich and big corporations huge tax breaks, the Republican tax plan would raise taxes on 87 million middle-class families, throw 13 million people off health insurance, and cut Medicare by $400 billion. This moral abomination is already igniting a firestorm across the country. Over the past two weeks, protests have erupted at 50 universities and in least 100 cities, while nearly 50 people have been arrested on Capitol Hill. And whether or not President Trump achieves his goal of signing this tax deal into law by the end of the year, this fight is just beginning. On December 4, prominent faith leaders announced plans for one of the largest waves of civil disobedience in U.S. history. 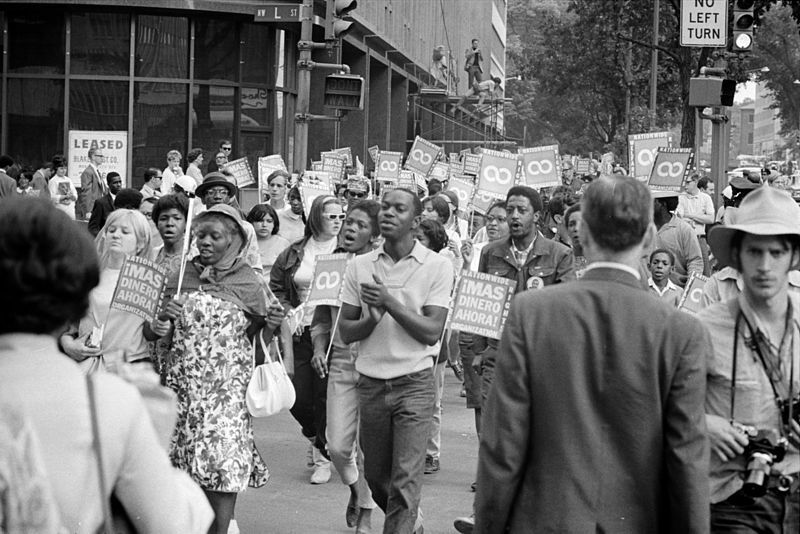 Dubbed the “Poor People’s Campaign: A National Call for Moral Revival,” this effort will mark the 50th anniversary of a similar initiative in 1968 that was undercut by the assassination of Dr. Martin Luther King. The campaign co-chairs, the Rev. Liz Theoharis and the Rev. Dr. William J. Barber II, are determined to pick up the baton from King and other 1960s leaders. They’ve called the Republican tax plan “an act of gross violence against America’s poor.” But this is just one of the motivations. “We are witnessing an emboldened attack on the poor and an exacerbation of systemic racism, ecological devastation, and the war economy that demands a response,” Rev. Barber said. A new Institute for Policy Studies report I edited reveals that conditions in each of these areas have worsened since 1968 by many measures. It documents the increased number of Americans below the poverty line, the acceleration of economic inequality, and the emergence of new forms of voter suppression and mass incarceration that further entrench systemic racism. It also highlights the growing imbalance in government spending on the military relative to social programs, and the intensification of racial and income disparities in access to clean air and water. Starting next spring, the Poor People’s Campaign aims to bring tens of thousands of poor and disenfranchised people, clergy, and other moral leaders to rallies at statehouses in at least 25 states, leading up to a major demonstration at the U.S. Capitol on June 21. While Republicans may succeed in scoring a short-term win for the political donor class, their tax plan is sparking a new moral movement that will lift up the millions of Americans living in poverty and build power for transformational change. The post The GOP Tax Plan Is Igniting a Movement for a Moral Economy appeared first on OtherWords.